MWC: Samsung ditches plastic for Galaxy S6 and curved S6 Edge | What Hi-Fi? Samsung has finally ditched plastic phone designs with the launch of the metal and glass Galaxy S6, Samsung's new flagship phone, and the Galaxy S6 edge (above), which is the first phone to feature a curved design on both sides. Samsung declared the new Galaxy S6 phones the "the most advanced smartphones on the market", as it revealed the handset to replace the Galaxy S5 and take on the iPhone 6. 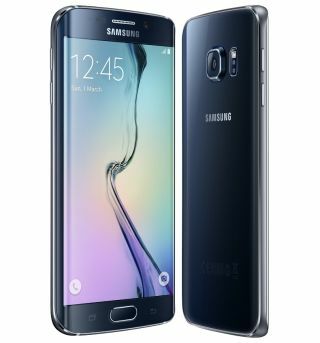 The Galaxy S6 (below) and Galaxy S6 Edge sport 5.1-inch Quad HD Super AMOLED screens, claiming the highest pixel density of any smartphone in the market, at 577ppi. Ditching the plastic of previous generations of Samsung Galaxy phones, the S6 models sport a metal and glass design with Corning Gorilla Glass 4. Samsung was long-criticised for the lacklustre build quality of its smartphones compared to the iPhone and rivals such as the HTC One M8 (which was earlier today at MWC usurped by the One M9 as HTC's flagship phone). Inside are Quad 2.1GHz and Quad 1.5Ghz, Octacore application processors, with both models featuring 16MP (rear) and 5MP (front) cameras. Samsung claimed they were the "fastest, brightest" cameras on the market during the company's Unpacked launch event, showing-off a series of apparent comparisons with pictures and videos taken on the latest iPhones. The Galaxy S6 storage options are 32, 64 and 128GB, while the S6 sports a 2550mAh battery and the S6 edge a slightly bigger 2600 mAh battery. For the first time, the batteries aren't replaceable, and there's no SD card slot so no expandable memory - sure to upset many Android fans who are used to being able to upgrade the handsets in this way. Both phones support wireless charging as standard with WPC and PMA charging accessories. While HTC revealed high-res audio support on its new One M9, there was no mention of this for the Galaxy S6 phones. Both the Galaxy S6 and S6 edge (below) are compatible, with the fingerprint scanning system protected by Samsung's upgraded Samsung KNOX "secure mobile platform". The phones will ship globally from 10th April in a range of colours that Samsung is describing as "colourful jewel tones" (white pearl, black sapphire, gold platinum, blue topaz and green emerald). Samsung also made an announcement around its Gear virtual reality business, revealing the Gear VR innovator edition for Galaxy S6 and S6 edge, the latest product of the VR collaboration between Samsung and Oculus.